Jalfrezi is a medium spiced stir fried dish with peppers, green chillies, onions, herbs and tomato-based sauce. Here in this recipe beans, carrot, baby corn, peppers, peas are sauted in roasted onion tomato sauce with spices. Roasted onion is the variation I tried and it adds roasted flavour to your curry. However different combo of vegetables and paneer can be used. 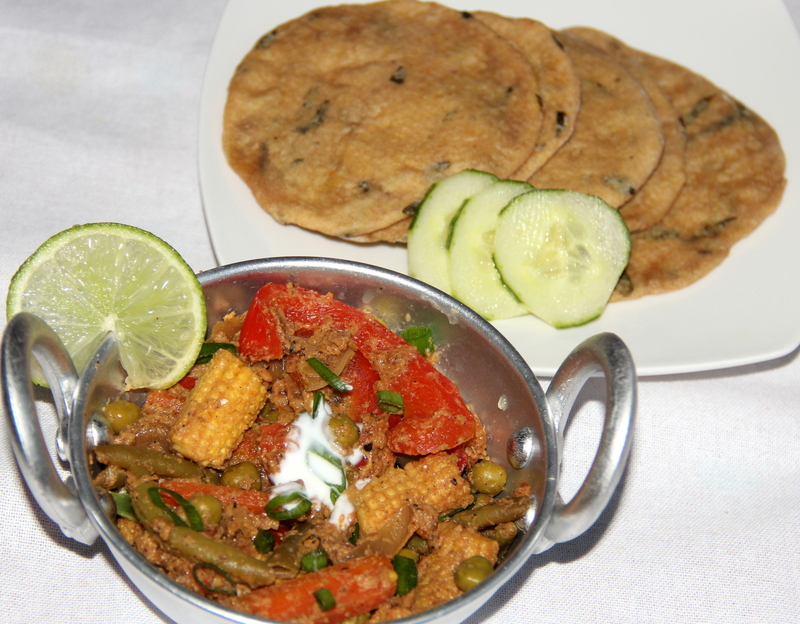 Enjoy this curry with Rice/Naan/Pooris (Recipe for Baked Pooris please click here). Once cooled blend roasted onions along with tomatoes to smooth puree and set aside. Heat oil in the pan add onion, slit green chillies (if using), ginger-garlic paste and saute for 1-2minututes. Add ground tomato-onion puree with dry masalas (red chilli powder, coriander powder, cumin powder) mix well and let it cook on a low flame till for 3-4minutes stirring in between. Then add capsicum/bell peppers, peas, tomatoes, salt, 2-3tbsp water if required and cook until the capsicums are tender and cooked. Once all the vegetables are cooked and coated well, turn off the flame and sprinkle some vinegar/lime juice mix well. Garnish with coriander/spring onion greens . Vegetables and spices can personalise as per the taste. Posted on August 11, 2014, in Indian, Side dish and tagged Chitras healthy kitchen, drchdietfood, Healthy indian gravies, Healthy Indian side dishes. Bookmark the permalink. 31 Comments. This looks great! Are using “num” to mean number, as in 1 onion? As those naan or pooris in the picture? my mouth is WATERING. What a healthy, vibrant dish. Thanx bunch..have a lovely day…. This looks so refreshing and different from how I usually make a side for pooris. How is a jalfrezi different from a kadai dish? Thanx June. ..I second you…. OMG Chitra, I just made a gravy version of the jalfrezi 🙂 Yummy!!!! Oh is it? Will wait for your version, I bet it will be tastier than mine. ..look forward for it…..have a lovely day. It’s looking absolutely delicious!! We went out for an Indian dinner yesterday (living in an Asian part of London this is a no-brainer ;-)) but this looks so much more appealing! Wow this dish looks like it is full of flavour and texture! Chitra this looks great, I love roasted vegetables. That looks so good Chitra!..I’ve had the non veg version of this, but this looks equally good. Tried this yesterday and it was fantastic 🙂 Great recipe. We’ve had jalfrezi out, but no comparison to this.